As much as I complain about the weather here in Iowa, there are a few things that I’m truly happy about. The school district here is amazing so there’s that. The work ethic and friendliness of the people is pretty awesome also. Unless you were hiding under a rock, you probably heard all about the Hawkeye Wave this past football season. Even US News ranked Iowa as #1 in their “Best States Overall Ranking” for 2018. But there’s one thing we’re known for above anything else: farms. From family farms to growing tomatoes in your back yard, there’s no lack of fresh produce to be found. We even have ordered beef and pork direct from a friend who raises them then we pick the meat up from the meat locker. I’ll continue to complain about the weather, but when it comes down to it, I’m pretty proud of my state. I even make a point to play games that have to do with farming! Animal-shaped meeples are adorable. Just sayin’. You may recall our Agricola game overview as well as our Agricola Family Edition game overview last year. Both of those titles take a bit of time to play so I was happy when I found Harvest Dice by Grey Fox Games. From the same creator as the Topiary game we recently featured, Harvest Dice is a dice game about farming. 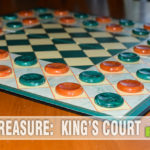 It can accommodate four players and doesn’t take a big time commitment to play. Two things I love, dice games and a hometown theme, rolled into one game. Perfect. There are a limited number of components in this compact game so setup is extremely quick. Score pads, pencils, a pig-shaped start player marker and nine dice. There are three of each green, red and orange dice representing lettuce, tomatoes and carrots. 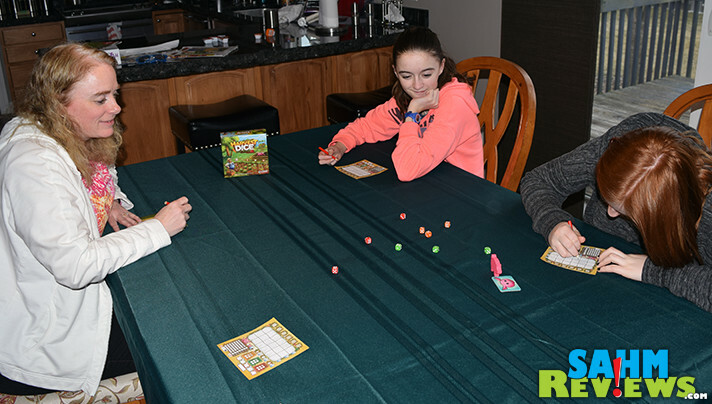 Up to four people can play so determine first player and hand that person all the dice, tear score sheets off the pad for each person and hand everyone a pencil. You’re ready to play Harvest Dice! 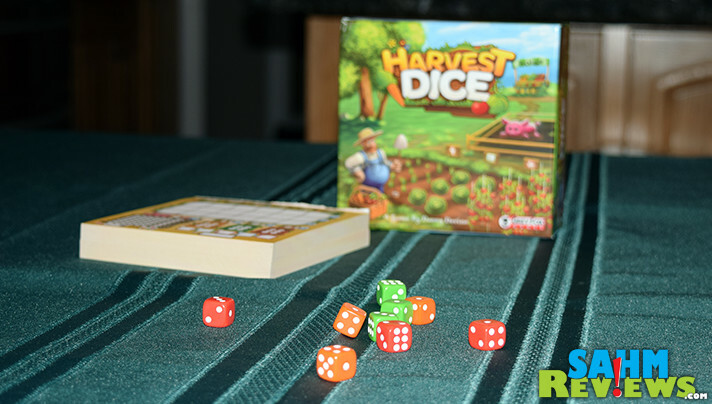 The goal of Harvest Dice is not only to plant a garden, but to have the most valuable produce at the end. The starting player rolls all the dice into the center of the table then drafts one to plant in their garden. If it’s orange, they draw a carrot (or a triangle for those of us with no art skills) corresponding to the row with the number of pips represented on the die they selected. If it’s green, a square to represent lettuce and if it’s red, a circle will suffice. 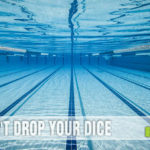 Play continues clockwise as each player drafts one die from the pool in the center. Unfortunately, gardens need to have some sense of order. If it’s the first time you are planting a particular crop, it can go anywhere on the board that corresponds with that particular value of die. If you’ve already planted that type, you need to plant the next one orthogonal to an existing one of that type. Play continues until there is only one die left in the pool. Note: Depending on the number of players, the final player each round may be drafting one less. Don’t worry because the first player pig token will pass each round so a different player will be short each round. When it comes to that last die, each player will make note of the color then will mark off the corresponding spot in that market section of their score pads. These markets are what will determine the value of each type of produce at the end of the game. So as you’re selecting and planting your types of produce, make note of what their value might be. If you’re consistently planting carrots and there are never any as the last die, all those carrots aren’t going to be worth much! 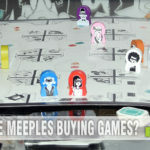 The player marker passes to the person on the left who gathers all the dice and rolls them into the center again signaling the beginning of the next round. Now here’s the interesting part that may or may not have happened in the first round. Dice… are… fickle. You can’t count on the numbers you want/need to show up. Let’s say you have a tomato planted in the row “6” of your garden, but there are only tomatoes with pips 4 or less in the pool. You can’t plant any of those because you wouldn’t meet the requirement for them to be orthogonal. So you do what any farmer does with this type of produce – you feed it to your pig! I had neighbors growing up that used to feed beer to their pig, but that’s a story for another day. 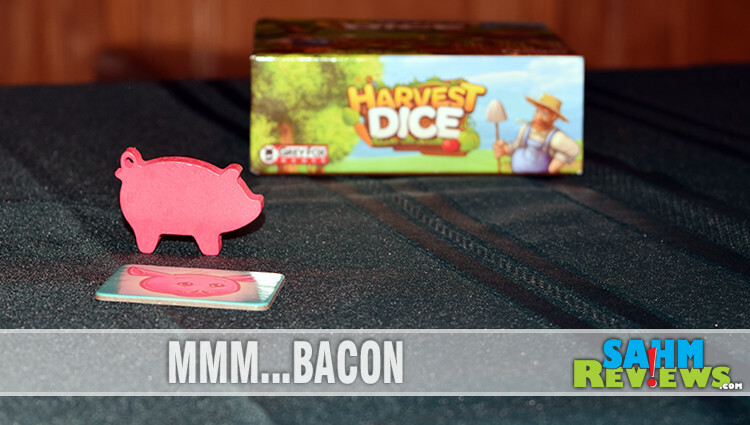 I digress… Whenever you cannot plant the crop of the die you drafted, you must feed it to the pig. Likewise, you may ONLY feed it to the pig if it cannot be planted. So don’t draft something plantable if you want to feed your pig. 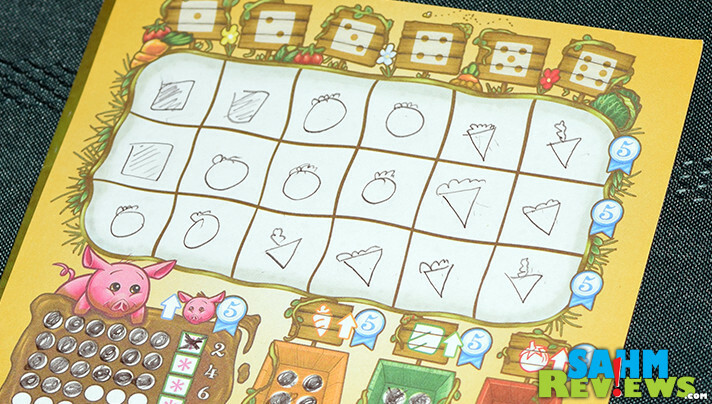 For each pip on the die you are feeding the pig, you mark one spot on the “Pig Power” track. When you fill a row, you earn a bonus to use on a future turn. If you’re playing the base game, that means your Pig Power can turn a die up or down one number. In the advanced game, you can change it one number OR change the color. You can also save up multiple rows and change one die more than once! The last round is triggered when one of three things happens. (1) Any player fills every space in their garden. 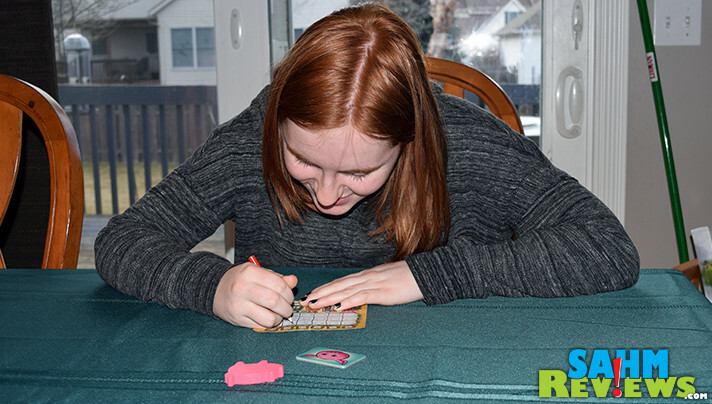 (2) Any player crosses off every circle on their pig. (3) All six circles in any single market are crossed off. Players count up the number of each type of vegetable then multiply it by the market value. Additional points are scored for each completed row as noted by the ribbons on the side. 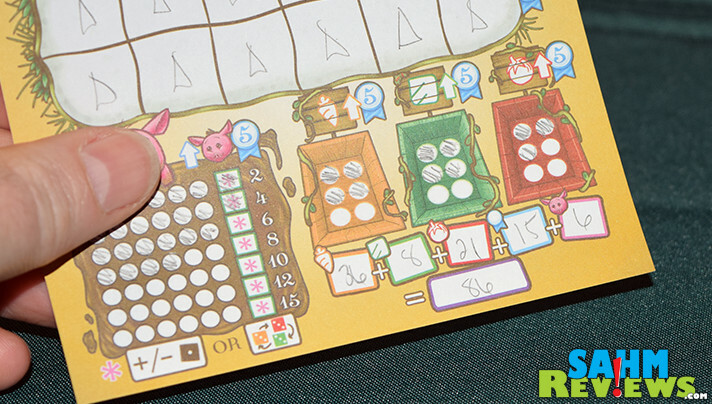 Finally, you’ll score equal to the value next to the most recently completed row on your pig track. Advanced rules have a few additional scoring rules but the game play itself is basically the same. The person with the most points is the best farmer and can claim Harvest Dice victory! 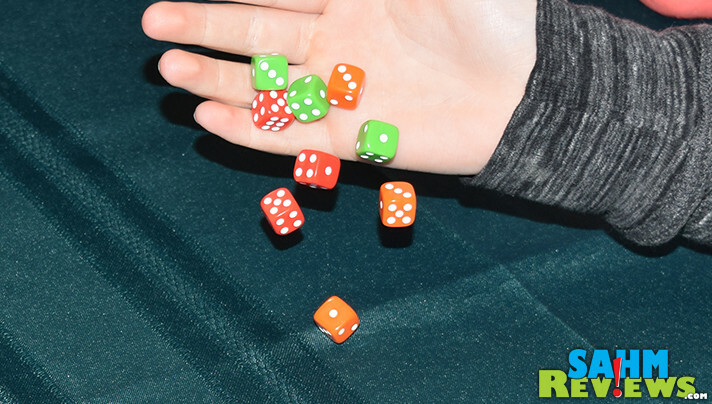 You don’t have to like vegetables to enjoy harvest dice, but a love of the randomness of dice games is a plus. 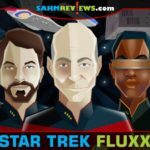 You can pick up a copy on Amazon for under $15! Visit Grey Fox Games’ website to see what games you can harvest. Check for the latest crop of news on their social channels: Facebook and Twitter. If steampunk is more your thing than farming, check out City of Gears on Kickstarter which will be ending soon! Have you ever planted a garden? Gardening and farming are so important and sadly most people don’t know much about it, let alone actually do it. This game seems great. I like the simple set-up and also how it makes players think. Seems like a great game for kids. I love knowing about these for when Liam is a bit older! This seems like a fun game for the grandbabies. I think I will send it to my youngest ones so their parents can play with them. A cute and a fun game indeed! I would love to have this and try it with the whole family! My little brother in law will enjoy this for sure! Looks like another fun game! We need to get back to family game nights and this would be a fun one to add to our collection! This looks like such a great game. I am going to need to check this out for my kiddies! I DOnt have much of a green thumb, but what a great way to teach agriculture to the young ones. I really like games that have fun rules and dice. This one looks like it is perfect for farming states.